A fabulous hashtag took over Instagram this week – #bestnine2015 – which chooses nine photos on your IG account with the most “likes”. I jumped on the band wagon, and was reminded of some wonderful projects made, and received, this year…. Granted – A few of these projects are not mine! The delightful pink mini was made for me by Sheila, Chelsea made her own quilt, the #sewingforsydney quilt top and that stunning AMH quilt mid-left is by Laurelle! But sharing is caring right? Anyway – this little collage encouraged me to look back on 2015, and see how much I achieved. I didn’t feel like I’d managed that much – sewing wise – this year, what with my dodgy shoulder/s, being time poor and running my ever expanding little thread business. 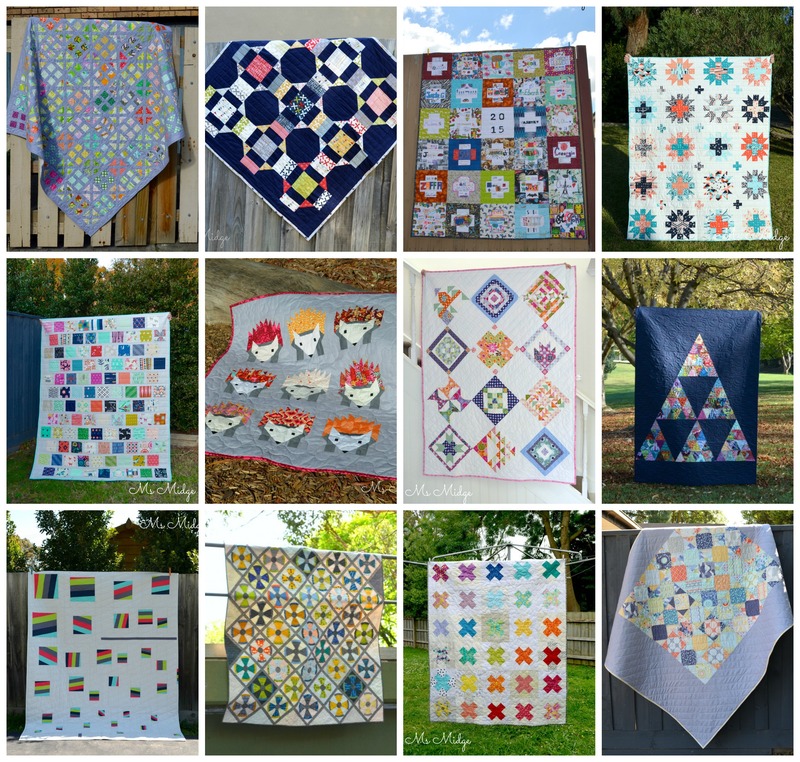 But I have to say – I was pleasantly surprised when I collated some of the bigger finishes for the year…..
TWELVE reasonably large quilts were made this year!?!?!? Two of them being collaborative efforts, in the Graduation Quilt and the #quiltblockstoendviolence quilt. That equates to one quilt per month, and I think that’s a pretty great average! Roll Call, from top left: Kiss-Cross; Charm Dash; Graduation; Star-Crossed; Toxic; New Terrain; My Hazel Hedgehog; Snapshots; Splice; Steam Punk; #quiltsblockstoendviolence; and a previously unseen finish, that I shall reveal properly one day, called “Pocket Full of Sunshine”. From top left: AMH mini; Friends; Geometric Cat; Heather Ross Mini; Indelible; Luminous; Rainy Days; Dear Deer; Rockpools; Siara; Gatsby; Indigenous Fire Star. Thrown in for good measure, a whole bunch of bags, pouches, newly started and not finished projects and you have rounded out my 2015. And in doing so, it suddenly makes sense as to why I’m so exhausted! Rounding up a year’s worth of projects is not only tiring, but it also shows me that I am far more productive than I think. I have actually slowed down considerably this year. 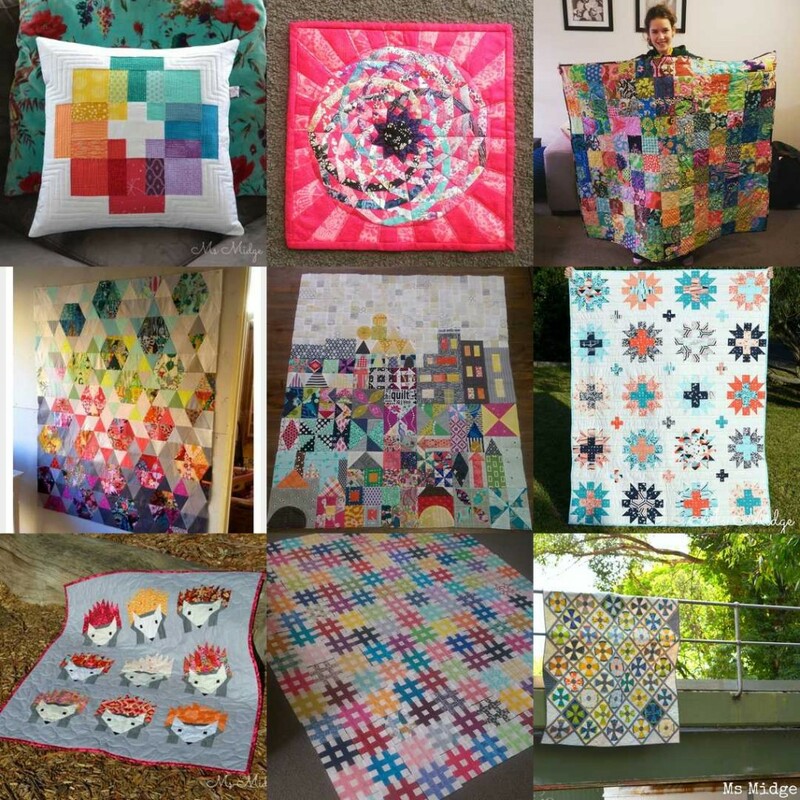 The #aussieaurifilclub and #aussiecharmswaps take a lot of my creative time away from the sewing machine – which I don’t mind, because I thoroughly enjoy supplying Aurifil and charm squares to my compatriots! The above collages show me I can keep on keeping on, just running my own race and fitting projects in here and there – when it suits me. And it also shows me just how diverse my taste in projects are! 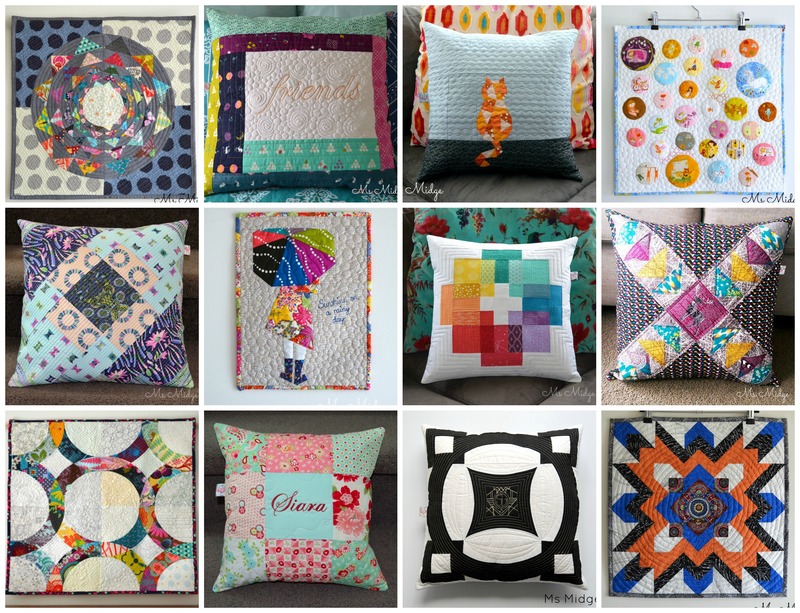 I love that they are all so different…..without doubling up fabric choices, or quilt designs. It certainly keeps me on my toes. As the year comes to a close, I really want to say a BIG FAT THANK YOU! 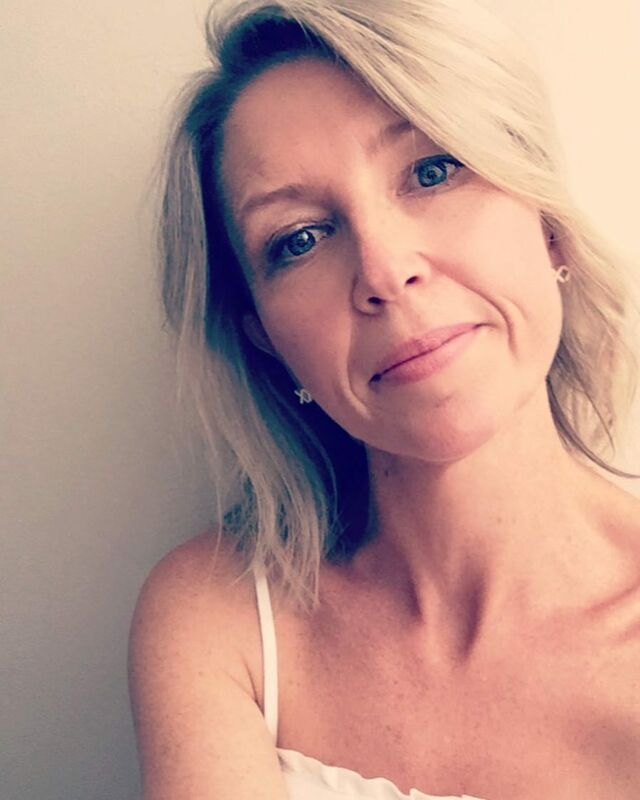 I’ve been blogging about my crafty efforts for quite a few years now, and your readership, comments and all-round encouragement really does give me the gentle nudge I require at times, to continue sharing my life with you all. I truly wish you all nothing but happiness of good wishes for 2016, and look forward to a really cruisy year (fingers crossed). May all your wishes come true!